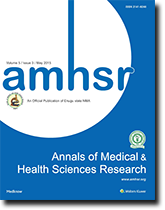 The Annals of Medical and Health Sciences Research (Print ISSN 2141-9248) is a peer-reviewed Open Access Journal dedicated to publishing of the most comprehensive and reliable research in medical and health sciences. The Journal focusses on all branches of basic medical and health sciences such as: Anaesthesia & Pain Management, Emergency Medicine & Trauma, General & Internal Medicine, Geriatric Medicine, Health & Social Care, Nursing & Midwifery, Pathology, Occupational Therapy, Surgery, Medical Devices, Pharmacology, Sports Medicine, and Holistic Medicine. The Journal also covers highly specialized medical disciplines such as: Infectious Disease & Microbiology, Pediatrics, Neurology, Dentistry, Dermatology, Oncology, Allergy & Clinical Immunology, Cardiovascular Disease, Endocrinology & Diabetes, Gastroenterology & Hematology, Neonatology, Nephrology, Ophthalmology & Optometry, Obstetrics & Gynaecology, Psychiatry, Respiratory Medicine, and Rheumatology. The Editorial Board members for the Annals of Medical and Health Sciences Research Journal comprises of universally reputed researchers from the Medical and Health Sciences Research. Manuscripts are subject to an exacting but, unbiased peer review, so as to ensure the quality and originality of the work.In addition to Research Articles, the Journal also publishes high quality Commentaries, Reviews, case studies, Letter to editor, Special articles, Medical Education Articles, Medical History Articles, Teaching Images Perspectives of pivotal importance.